So this years first uni semester is done and dusted, now I have some free time. Blog all the things! This is a follow up post for discussion that was started on LinkedIn about showing features older, or newer, then a certain date different colours The main post was about using free, or low cost, solutions in order to aid in mapping water networks. I recommend that everyone watch it. A very good presentation. 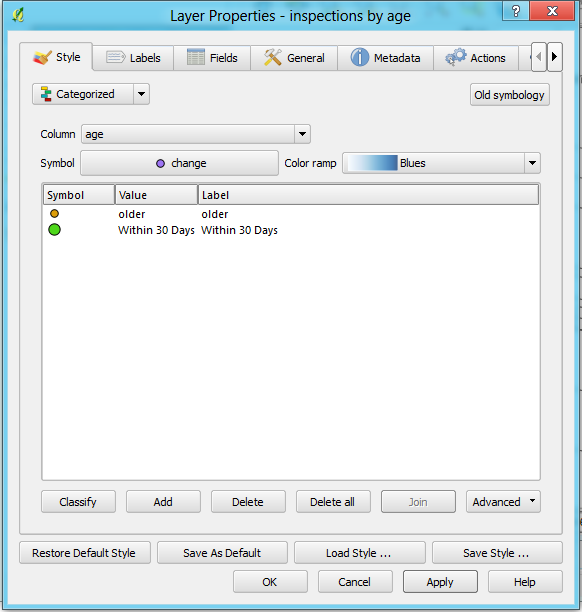 I recommended that you could use the rule based rendering engine but the expression engine in QGIS doesn’t have any date functions yet. All good we can add them if we need and once I get my head around the expression engine I plan on doing exactly that. But for now we can do it a different way. 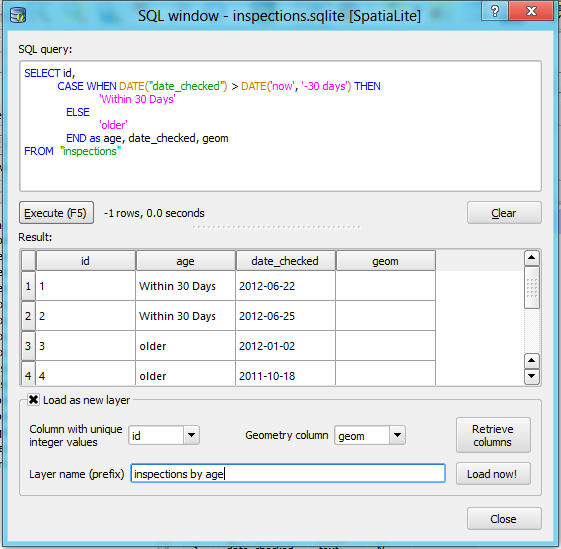 We are going to use Spatialite, but any database will do (syntax and process will vary). As you can see anything that is within the 30 days now has the “Within 30 Days” string in the age column, or else it has “older”. CASE statements can be very powerful things in SQL sometimes. It might be a simple thing to some but sometimes it’s hard to find the right words to describe what you want when you are looking for this kind of thing. So hopefully this has helped a few people get started with visualizing their time/date based data in QGIS. 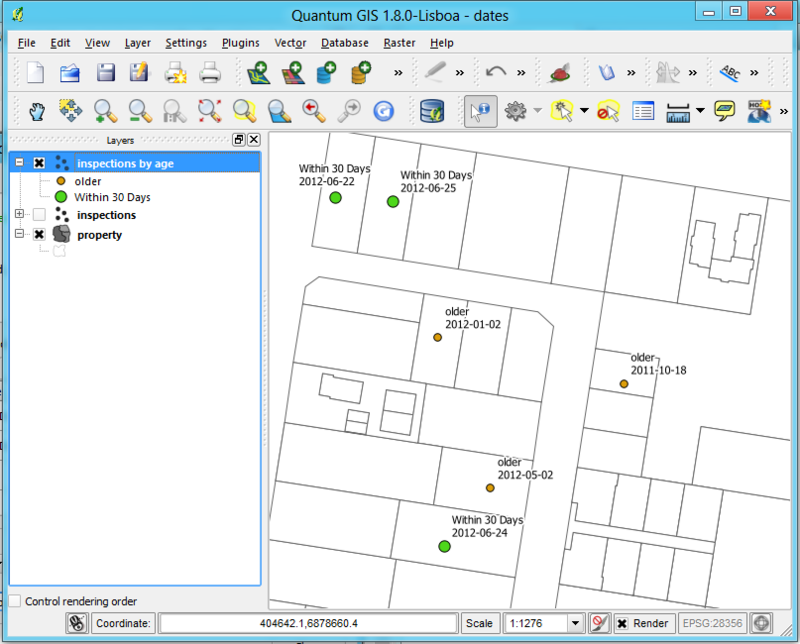 Previous Post QGIS 1.8 is out! Nice example Nathan. Really practical use of temporal mapping. Very typical of inspection based styling in local gov. Can think of a similar case with regards to environmental mapping i.e weed spread over time. Once I get one of the guys to check over the code it will be in the nightly builds. I did something similar with SpatiaLite to show the requests of construction licenses in force, with a term to end, and time expired, in a portuguese local government. With this new way of applying styles everything will become easier!